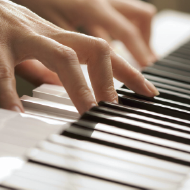 Begin your life-long enjoyment of playing the piano! I teach young people how to play the piano in a fun, fast-paced environment that makes them want to learn more. My method involves the multi-leveled piano series by Bastien and I supplement this with some singing fun and a chord method that allows each student to experience Popular music along side the all-important Classical techniques. It only takes one lesson to begin discovering the musical potential within your son or daughter that will be with them the rest of their lives. Contact us today!